Our Grand Tawny is golden russet in colour with tinges of green. The bouquet offers lifted notes of raisins, plums and some savouriness, with an attractive nutty aroma. Serve with Whisky, chocolate and hazelnut cake, Melon and tawny with spiced honey vodka and cinnamon yoghurt, or blue cheese and macadamia nuts. Golden russet with tinges of green. Lifted notes of raisins, plums and some savouriness, with an attractive nutty aroma. Mellow, rich flavours of treacle and butterscotch highlighting a spicy concentrated sweetness on the mid-palate, balanced by an elegant, mature drying finish. 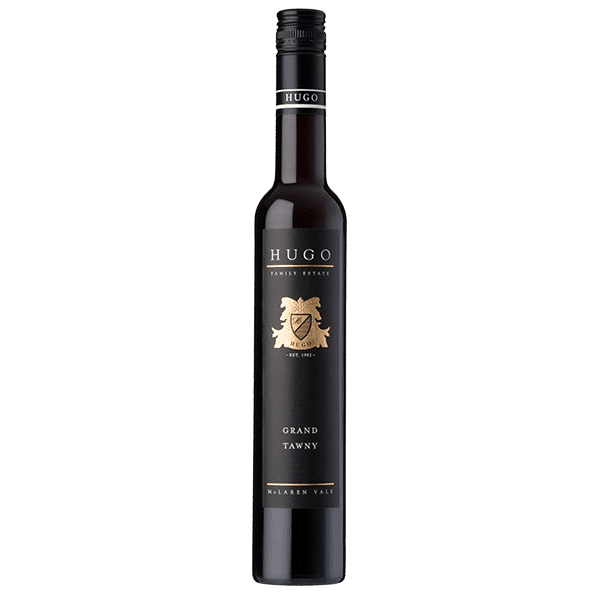 A fine fortified wine, with distinct hazelnut characters, stylishly blended using dry grown Grenache fruit sourced from the family vineyard. The blend has an average age in excess of 10 years with a component drawn from the Hugo Tawny of the 1980’s. Winemaker John’s father Colin, planted the original Grenache bush vines in 1951. Whisky, chocolate and hazelnut cake, Melon and tawny with spiced honey vodka and cinnamon yoghurt, or blue cheese and macadamia nuts.